HOUSTON, Sept. 25, 2017 /PRNewswire/ -- BBVA Executive Chairman Francisco González has reinforced the Group's commitment to the U.S. after the most recent natural disasters. "We're going to redouble our commitment to those affected through a number of actions," he explained. In Houston, where he met Friday with the city's mayor, Sylvester Turner, he gave a message of solidarity on behalf of the entire BBVA Group. Francisco González also announced that he is going to visit Mexico City in the coming days to see first-hand the damages caused by the Sept. 19 earthquake. 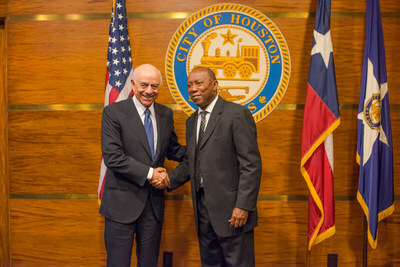 BBVA Executive Chairman Francisco González, left, greets Houston Mayor Sylvester Turner at City Hall on Friday. He gave a message of solidarity on behalf of the entire BBVA Group. 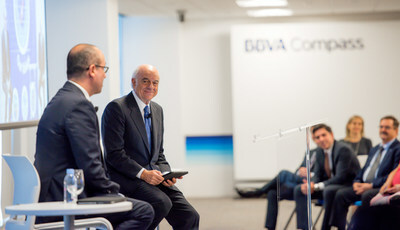 BBVA Executive Chairman Francisco González, right, with BBVA Compass CEO Onur Genç at an event for employees at BBVA Compass Plaza during his visit to Houston on Friday. 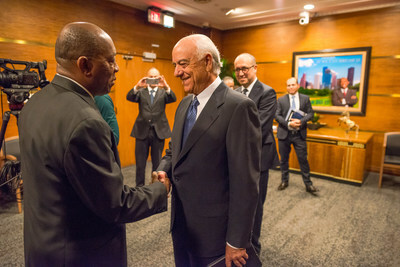 BBVA Executive Chairman Francisco González, right, greets Houston Mayor Sylvester Turner at City Hall on Friday. BBVA Executive Chairman Francisco González, at podium, met with employees at BBVA Compass Plaza during his visit to Houston and thanked everyone for their efforts to alleviate the impact of Harvey. The Monday after Harvey hit, when much of Houston was still underwater, BBVA Compass announced generous donations to the American Red Cross and Hurricane Harvey Relief Fund. It also has established a fund for its employees who suffered losses during Harvey and also Hurricane Irma, and it plans to raise another $100,000 for the Hurricane Harvey Relief Fund through the BBVA Compass Dynamo Charities Cup. That match, an exhibition match between the Houston Dynamo and Mexico's Cruz Azul, will be played on Oct. 5 at BBVA Compass Stadium in Houston's East End. Altogether, thanks to the contributions of BBVA, its employees, customers and the Dynamo Charities Cup, it is estimated that more than $2 million will go to those affected. 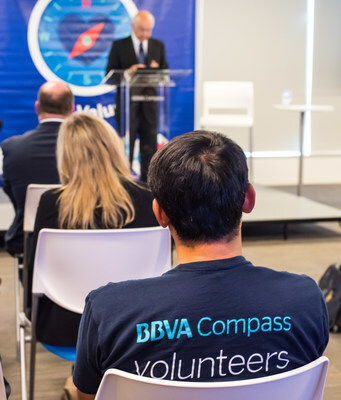 BBVA's Executive Chairman thanked all the BBVA Compass employees and volunteers for their efforts to alleviate the impact of Harvey, and for the quick response in providing answers to customers during the emergency. González said that BBVA Compass has played a key role in returning some sense of normalcy to Houston and praised the city's spirit. "Texas and Florida are making an unprecedented effort to recover from devastating hurricanes," Francisco González said. "We at BBVA are joining in this great effort with some initiatives. We want to raise more than $2 million to help the victims. The largest part of this -- a projected $1.5 million -- is coming from BBVA itself, but we also marshaled the generous support of employees and customers. The U.S. is a very important country for BBVA. It´s our home. And so is Mexico, which was just hit by another earthquake with tragic consequences. I will be there next week to demonstrate the BBVA Group's support for all Mexicans and BBVA Bancomer." Harvey affected more than 100 BBVA Compass branches in Texas, eight of which remain closed, while five will require a significant reconstruction. In addition, 75 ATMs were affected. Irma affected dozens of BBVA Compass branches and 31 ATMs in Florida. After Houston, Francisco González will visit Mexico City in the coming days to see first-hand the damages caused by the recent earthquake. BBVA Bancomer, the Mexican franchise of BBVA, is assisting the Red Cross and cooperating with the Civil Protection Authorities to help those affected and more actions are being considered. BBVA Compass also ordered other measures such as deferments in loans and credit cards, discounts on mortgage loans, loans for construction and renovation, and discounts on car loans, all of which were also implemented for the victims of Hurricane Irma in Florida. Hurricane Harvey's economic impact could reach $111 billion, according to BBVA Research estimates. This makes it the second most costly natural disaster in the recent history of the United States, surpassed only by Hurricane Katrina in 2005. In addition, according to BBVA Research, the region will have to work hard to maintain its economic appeal in the long term, since devastating meteorological phenomena can force people to migrate, reducing the area's economic potential. The economic impact of Hurricane Irma could be as much as $52 billion in Florida, according to BBVA Research. After causing severe damage in the Caribbean, it struck the southern part of the Florida Keys with wind over 200km/h. Some of the state's largest metropolitan areas were affected, including Miami, Tampa and Jacksonville. According to BBVA Research's analysis, once the reconstruction work begins and economic activity is normalized, thanks to insurance and public and private assistance funds, the net economic cost will be lowered. BBVA Compass is the fourth-largest bank in terms of deposit market share in Texas and Houston. It was acquired by BBVA in 2007. Since then, BBVA Group has consolidated its presence in the U.S. It has a market share of 6.13 percent in the Sunbelt (Texas, Alabama, Arizona, California, Florida, Colorado and New Mexico). It has 651 branches and it maintains a New York office; it also has an office in San Francisco, the world's tech innovation capital, and the BBVA Creation Center in Dallas, which specializes in software engineering, UX and design. BBVA (NYSE: BBVA) is a customer-centric global financial services group founded in 1857. The Group is the largest financial institution in Spain and Mexico and it has leading franchises in South America and the Sunbelt Region of the United States; and it is also the leading shareholder in Garanti, Turkey's biggest bank for market capitalization. Its diversified business is focused on high-growth markets and it relies on technology as a key sustainable competitive advantage. Corporate responsibility is at the core of its business model. BBVA fosters financial education and inclusion, and supports scientific research and culture. It operates with the highest integrity, a long-term vision and applies the best practices. More information about BBVA Group can be found at bbva.com. BBVA Compass is a Sunbelt-based financial institution that operates 651 branches, including 337 in Texas, 89 in Alabama, 63 in Arizona, 61 in California, 45 in Florida, 38 in Colorado and 18 in New Mexico. BBVA Compass ranks among the top 25 largest U.S. commercial banks based on deposit market share and ranks among the largest banks in Alabama (2nd), Texas (4th) and Arizona (5th). BBVA Compass has been recognized as one of the leading small business lenders by the Small Business Administration (SBA) and ranked 5th nationally in the total number of SBA loans originated in fiscal year 2016. Additional information about BBVA Compass can be found at www.bbvacompass.com. For more BBVA Compass news, follow @BBVACompassNews on Twitter or visit newsroom.bbvacompass.com.